Agnostics and atheists have been making a lot of noise in recent years, in spite of the fact that their belief systems are so obviously flawed. To counter their propaganda we need a flow of books exposing just how flimsy their arguments are. Jeffrey Johnson has chosen the word ‘absurdity’ to characterise these, and he has chosen well. Chapter by chapter he strips unbelief of any vestige of credibility, then shows with crystal clarity why the biblical case for God stands supreme when contrasted with all other philosophical and religious belief systems. I predict that this book will be as great a help to many of its readers as it has been to me, and I commend it warmly. As Christians struggle to hold onto a semblance of sanity in the midst of the collapse of Western morality and thought, a sound foundation upon which to stand in explaining our unwillingness to bow the knee to Caesar is a must. 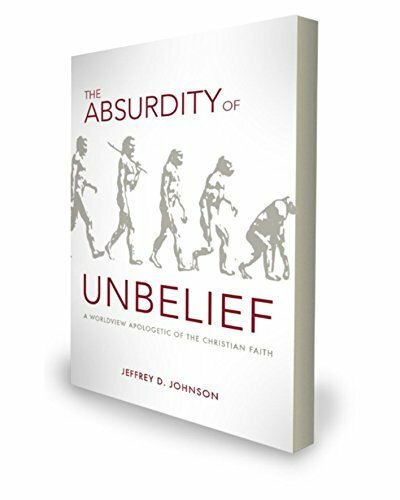 In The Absurdity of Unbelief, Jeffrey Johnson provides a clear and compelling case for the Christian faith, readable and usable for believer and unbeliever alike. The Bible doesn’t merely state the atheist’s creed. It also provides us with an assessment of that creed: “The fool has said in his heart, ‘There is no God’” (Psalm 14:1). In his new book The Absurdity of Unbelief, Jeffrey Johnson ably demonstrates that the Scripture writer isn’t hurling insults or engaging in ad hominem. Rather, as Johnson shows, the Bible is simply telling the truth. To reject the triune God of Scripture and to replace him with a non-biblical worldview is profoundly stupid! How does Johnson defend this thesis (and biblical claim)? First, he argues that human beliefs are not neutral but are in certain ways biased and preconditioned. Next, Johnson proceeds, by means of reductio ad absurdum, to expose the irrationality of the world’s major non-biblical philosophies and unbiblical religions. Finally, Johnson carefully sets forth the arguments and lays out the evidence for the veracity of Christianity, and he concludes with an earnest and humble appeal to receive the gospel of Jesus Christ, which alone can restore true meaning to the world and wherein is found true wisdom from God. The Absurdity of Unbelief will challenge the unbeliever’s skepticism and will confirm the believer’s faith. I highly recommend it! Johnson’s new book, The Absurdity of Unbelief, demonstrates the absurdity of most of the worldviews which parade themselves as truth – naturalism, relativism, atheism, existentialism, pantheism, materialism, and the rest. He clearly examines the premises of each system of thought and demonstrates their many contradictions. His scholarship and historical understanding of the entire field of philosophy and the other so-called religions is evident throughout the book. He has done a masterful job in showing that the Christian worldview is the only system that will meet all the tests of logic and ethics. He concludes this excellent work with a passionate call to submit ourselves to the God of the Scriptures who has given us His son, Jesus Christ, who will remove all of our sin and guilt. To trust in any of the other philosophical or religious positions refusing to accept God’s gracious offer of salvation is indeed absurd! The Absurdity of Unbelief is not just another book on apologetics. This author knows his way around all that's been previously written and lines it out for the reader in a concise and orderly way. Whether you're familiar with what has gone before or not, whether your worldview is clear in your mind or you don't even know what a worldview is, you will get much out of this book. The author makes clear and bold claims that challenge both believer and nonbeliever and then he proves them! This book's versatility makes it a must-have for Sunday School studies, small groups of ANY kind, home schooling groups, as a hand-out for witnessing/discussion purposes with family, neighbors and the lost, and as a reference for one's own bookshelf! Every once in a while I come across a book that is difficult for me to review. This is the way I feel with The Absurdity of Unbelief by Jeffrey Johnson. I feel that no matter what I say I won't do this book justice, so I will begin with my conclusion. Buy this book when it releases. Better yet, buy two copies so you have one to give away. This book is an outstanding look into many differing worldviews, dissecting them one by one until only the Christian worldview remains as the only rational view. Johnson's knowledge of each of these worldviews is what really shines through in this book. With great clarity he is able to layout the beliefs of each worldview and then show the reader why holding to one of these worldviews is indeed absurd. Instead of first going on the defensive, Johnson takes an offensive approach, attacking each worldview head on and challenging its presuppositions. He states, "It is not sufficient for an atheist or any other skeptic to simply attack the walls of the Christian worldview. They must also defend their own ground. They must protect their own presuppositions and belief system. My aim is to show that the castle of unbelief rests upon quicksand, and the more unbelievers struggle to defend their worldview, the more they sink under the weight of their worldview. Atheism, deism, naturalism, relativism, existentialism, pantheism, polytheism, and any other non-Christian ism’s, along with Judaism and Islam, are incoherent and, thus, rationally indefensible." Johnson begins by first discussing how faith is neither blind, solely an experience or irrational. He rightly states that "Scriptures never separate faith from reality. Faith may believe in spiritual realities that transcend our empirical senses, but God is not asking us to suspend logic or for us to believe in something that is either irrational or unsubstantiated. He is not asking us to take a leap of faith into the darkness. If anything, we are called to run to the light and build our faith on the most solid foundation possible - His Word." I can still recall when this truth hit me as a new believer, that the Christian faith wasn't blind or irrational, but that the more and more I dug in the more reality became clear in light of God's truth. Part two of the book focuses on the fact that no one's belief system is formed in an isolated bubble. We all have different areas that shape and mold us and these areas affect our thinking as well. Johnson discusses six of these areas in this section: 1) Self interest 2) self-evident truths 3) conscience 4) our worldview 5) three ultimate questions (1. What exists outside of our minds? 2. What exists inside of our minds? and 3. how do we feel about it?) and 6) our presuppositions. Johnson is crystal clear in the chapter on conscience when he states that, "If rational sanity demands submission to God, man has proven that he is more willing to embrace intellectual absurdity than to succumb to the knowledge of the truth. Because fallen man would rather accept a lie than submit to the truth, they stand in front of a mirror scratching, picking, and clawing at their faces in order to remove the image of God that is staring back at them. They are eager to erect a god fashioned in their own human likeness rather than submitting to the God who made them in His own divine likeness. They would rather worship a dumb idol in order to obtain intellectual independence than submit to the God of all wisdom. In so doing, they are willing to sell their souls for a bowl of soup. Absurdity and a guilty conscience, however, is something mankind, made in His image, will never shake until they turn to Christ and bow the knee to His eternal Lordship." In the chapters that follow Johnson shows this point well. Each worldview/religious system that he examines caves under it's own weight, not able to answer difficult questions showing that "to continue to embrace and defend a faulty and incoherent worldview is to prove you are absurd and willfully blind to the truth." Johnson then moves on to show the irrationality of: naturalism, evolution, empiricism & determinism, relativism & nihilism, existentialism, postmodernism, nontheistic religions, Judaism & Islam, non-trinitarian religions and monism. Johnson's interaction with each of these worldviews is clear, understandable and will certainly build up believers and hopefully bring skeptics to question their own worldview. I was impressed throughout this book with Johnson's ability to bring in multiple sources, cite them, explain them and interact with all of them in a very clear manner. This book, while it does contain some portions that will challenge the reader to think, would be of great benefit to anyone who picks it up and reads it. With so much information compiled into one book it is a resource that will certainly become a wonderful reference for all who have it as well. Johnson concludes the book with a call to come to Christ. An apologetic is really useless if it only amounts to head knowledge gained but people still left in darkness. So Johnson closes with these words: [Christ] came to die for sinners (1Tim. 1:15). He freely offers Himself to all who truly desire to be delivered from their sins and their guilt. Those who hide and cover their sins will remain in their sins, but for those who repent–taking ownership and confessing their sins before God– and believe in their hearts that Jesus is who He says that He is, shall be saved. Dear reader, there is forgiveness. Your guilt and sin maybe removed as far as the East is from the West, and the perfect righteousness of Christ could be credited to your account. All your guilt may be washed away, for the blood of Jesus is able to cleanse you from all of your sins. “Come unto me,” Christ says, “and I will give you rest.” God made this promise. He cannot lie. He is able to save the worst of sinners. Salvation is free; you only haveto believe. And, belief, my dear friends, is the only reason able thing to do. Amen! A perfectly stated end to a tremendous book. I was truly blessed by this book and look forward to interacting with it and sharing it in the future.